Mar Celebrating a successfull competition! Jan Dynomites Digest - Welcome to 2018! 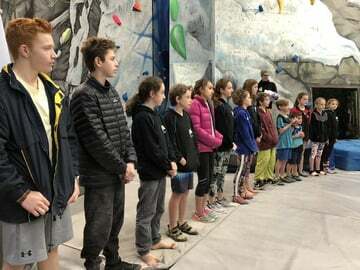 Well done to everyone that competed at the National Bouldering Competition over the weekend in Mt. Maunganui. There was some really strong competition, which made it really exciting and a little nervy to watch at times! It really highlighted the massive depth of talent especially in the Youth C and B female groups with good numbers of really strong athletes spurring each other on to better and better performances. We're really proud of how well the DynoMites team members role modeled such positive behaviours such as collaboration and supporting others. It was great to see everyone displaying these attributes and the collective success and friendships that develop as a result. TreeFrog Sanders, Zil Yeaman, Andrea McDonald, Mick Domaneschi, Lyall Jellyman, Oil Wiles, Steven Butcher, Eric Duggan, Albert Cariño, Julia White, Adam Sutton, Kelda Robinson, Eugine Robinson, Judah Plester, Jo Gould, Rosa Friend, Vivienne Wolffe, Jenny Brownlie Williams. Searching for and finding gear when it was "misplaced"
Thanks also to the route setters, its never easy to get it right for such diversity, but they worked to the wee small hours of the mornings and also helped make it a great competition. Meanwhile in a far away place called Wellington…we also held a club night on Sunday 24 June for those who were not able to make the competition, so thank you to our volunteer coaches, Frank Foster, Nino Pankusz, Eesha Gugaz and Rory Wagner who held the fort and made this session possible at the same time. The National Bouldering Competition that we are hosting in September will be a fantastic opportunity for any climbers who haven't had the chance to travel to compete in a National event yet. Soon we will be coming back asking for your support to make this happen, the more people that can help, even if just in a small way, the easier it is to be able to offer these opportunities for our climbers close to home. If there is anything that you would like to put your hand up for now, please don't wait, reach out and let us know!